…to prepare young people to make ethical and moral choices over their lifetimes by instilling in them the values of the Scout Oath and Law. Some of the best things about Cub Scouting are the activities the boys (and sometimes you) get to do: camping, hiking, racing model cars, going on field trips, or doing projects that help our community and the people who live here. Cub Scouting means “doing.” All our activities are designed to have the boys doing something and by “doing” they learn some very valuable life lessons. But your role in the troop can be passive. We don’t expect a parent to leap right in. But, be warned, Cub Scouting might touch you as it touches your son and you might eventually get ‘the fever’ that many of our leaders got from Scouting. But you are encouraged to go at your own pace. Cub Scouting is for boys in the first through fifth grades. 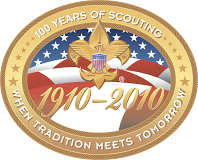 Boys who who have completed the fifth grade, can no longer join Cub Scouts, but they are eligible to join a Boy Scout Troop. Activities are used to achieve the aims of Scouting—citizenship training, character development, and personal fitness. Many of the activities happen in the den (with the children in their grade) or with the entire pack (with all the grade levels). Our Scouts always have Go-and-See’s and plenty of outdoor and indoor activities to help them achieve goals.